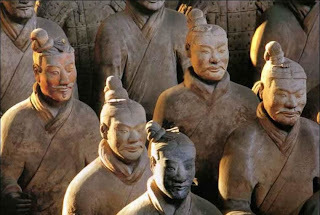 Terra Cotta Warriors and Horses are the most significant archeological excavations of the 20th century. Sites were found near the tomb of Emperor Qin's first in Xi'an, Shaanxi Province is a tourist location that should not be missed when visiting China. Terra Cotta Warriors and Horses is a form of funerary art buried with Emperor Qin Shi Huang in 210-209 BC. On this site, you will see statues of warriors, chariots, horses, officials, acrobats, strongmen, and musicians. These statues have a height that varies between 183-195 centimeters. 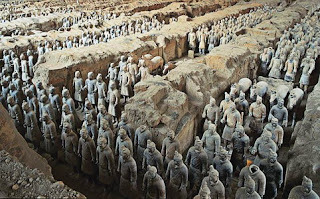 Current estimates, that the three holes Terra Cotta Warriors and Horses there are more than 8,000 soldiers (with the highest-ranking generals), 130 trains with 520 horses and 150 cavalry horses. Most of these sculptures were still buried in the hole. Sites Terra Cotta Warriors and Horses Museum is part of the Terra Cotta which covers an area of ​​16 300 square meters and is divided into three sections: the first hole, second, and third. Each hole is marked in order of discovery. The hole was the largest single number. In it there are more than 6,000 statues of warriors and horses in battle formation which is the main strength of the underground army. Hole number two who was found in 1976, contains more than 1,300 statues of military forces, including archers, chariots, and cavalry. While the hole number three is the smallest and contains only 68 statues and a train even though the hole is the entire army command center. Terra Cotta Warriors and Horses is a sensational archaeological discovery that has put Xian on the map for tourists. The site is also listed as one of the world cultural heritage by UNESCO in 1987.